So much talk about the route and now it’s time to focus on the race. This is the longest event on the calendar and loaded with prestige, history and action. Fate means this Sunday’s edition reverting to a pre-2008 course with neither the new climb of Pompeiana nor Le Mànie. It would be a gift to the sprinters only paradoxically these late changes mean many of them might not be ready for it. Here’s the race preview for Sunday with the route, scenarios, contenders separated from pretenders as well as TV times, the weather and more. The Route: after the neutral roll out of Milan the race speeds along large roads and crosses the vast Po valley and the Pianura Padana, the flat plains that grow much of Italy’s rice crop. An early breakaway goes but it’s easy to control. Ovada is the town marks the end of the flatlands and the start of the long Passo del Turchino and where riders climbed into their team buses last year. This mountain pass used to be important to the race but it’s a slow and gradual climb, the road is tracked by a railway line, a clue that the gradient is no worry. Turchino means a shade of blue in Italian although it’s rarely used, like azur in French and it’s just like the Mediterranean sea that awaits on the other side. The pass is a symbolic moment, lifting riders away from the foggy plains towards the shimmering spectacle of the Mediterranean, from a landscape defined by soil and toil to another lined with beaches and escapism. 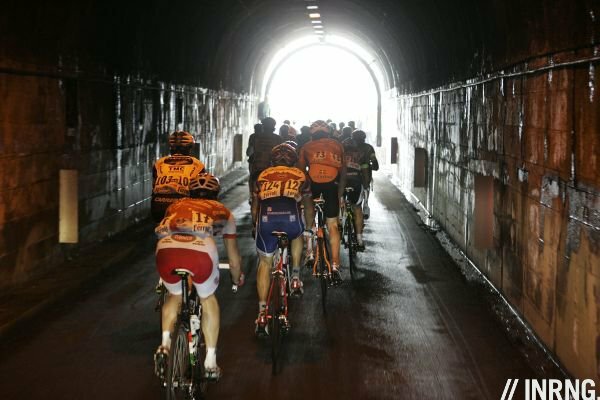 The race drops down to the coast via more tunnels to Voltri on the outskirts of Genova. By now the halfway point has been crossed but the finish feels closer, the coastal is familiar. But this only adds to the stress as the race goes from one town to another, negotiating modern street furniture and old town squares alike. In time comes the cape trinity: Capo Mele, Capo Cervo and Capo Berta. These are small climbs but serve as landmarks to break up the flat road and by now the race has done 250km. Then it’s on to the Cipressa. This starts with sharp right hander and quickly climbs above the coastal town of San Lorenzo, the nine percent gradient bites hard after 270km. This is a proper moment of climbing that can prove fatal for the sprinters, the average of 4% is a blend of a steep start and a after crossing the autostrada, a flat portion over the top where dropped riders flounder. Television cameras often follow the back of the peloton to catalogue the dropped riders because the toboggan-run descent, the most technical part of the course, is often too fast to film in full. 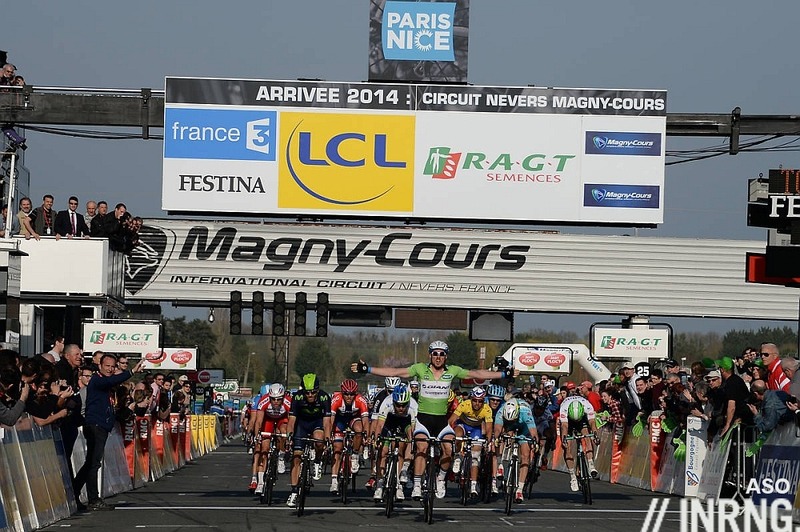 The Finish: the Poggio starts with 9.7km to go and marks the final phase of the race. A furious pace is inevitable. A right flick off the main coastal road is followed by series of wide bends that are so fast riders have to brake despite going uphill. Positioning is everything as the road winds up. Unlike the Cipressa this isn’t steep, there’s only one short step at 8%. But after 285km the legs are drained and the elastic is tight and brittle and the Poggio is just enough to break up the group. The descent is fast and marked by a series of curves and five hairpins. The race has been won on the descent before and it has its technical moments but it is really a very physical effort, a series of sprints out of the corners. Carrying speed into the bends matters but what makes the difference is being able to pump out big watts on every bend exit after 290km. The ramp ends and the race sweeps into town with one dog legged bend before the final 500 metres. The Scenario: we have the paradox of a course suited to the sprinters yet the sprinters haven’t had enough time to get ready. Pompeiana invited the sprinters to make alternative plans and the late course change meant little time to revise training schedules. You don’t aim for a 300km race on a whim. The chart shows the size of the front group in Sanremo. All the blue bars represent the pre-Le Mànie route, comparable to 2014. A word of caution with the stats as the cold numbers don’t always capture a fluid situation but the takeaway is that a “bunch” sprint is really a reduced group, a selection of 30-40 riders. Mark Cavendish is grabbing the attention but the field include many sprinters and crucially teams dedicated to their leaders. If anything Cavendish is a distraction because if he wants a sprint finish, his team have other options. The flatter route coupled with the knowledge that they’ll never have a chance again is likely to motivate teams to ensure a sprint finish and better still for them, the exclusion of Le Mànie means a larger peloton with more sprint train locomotives as they tackle the Cipressa and Poggio. But all the more reason for others to derail the sprinters. Several teams want a sprint finish but each wants the other squads to work for this scenario. It’ll be crucial to see who is chasing who, for example say OPQS’s Kwiatkowksi and Katusha’s Paolini take off over the Cipressa, will Lotto-Belisol and Giant-Shimano lead the chase or will they hesitate in the expectation or hope that someone else does the work? What will he do, attack or sprint? Ideally he wants a furious pace over the Cipressa and Poggio to drop all the other sprinters and then he wins the sprint from the surviving group. If it’s a bunch sprint Mark Cavendish is an obvious pick because of his speed and he’s just won a stage in Tirreno-Adriatico. But can he cope with the climbs? For more certain answers see André Greipel as a regular surprise when it comes to hilly finishes and John Degenkolb who’s climbing isn’t as a surprise… but in both cases it would mark a transformation from sprinter to Monumental champion although Degenkolb was fifth in 2012. The Germans each come with dedicated teams while OPQS have a sprinter cell within the squad alongside attackers like Kwiatkowski, Štybar and Bakelants. I’d also watch FDJ’s Arnaud Démare, a fast finisher with a hungry appetite for big wins. He was recently beaten by IAM’s Matteo Pelucchi win in Tirreno but the Italian’s win was no fluke, he is fast and aggressive. 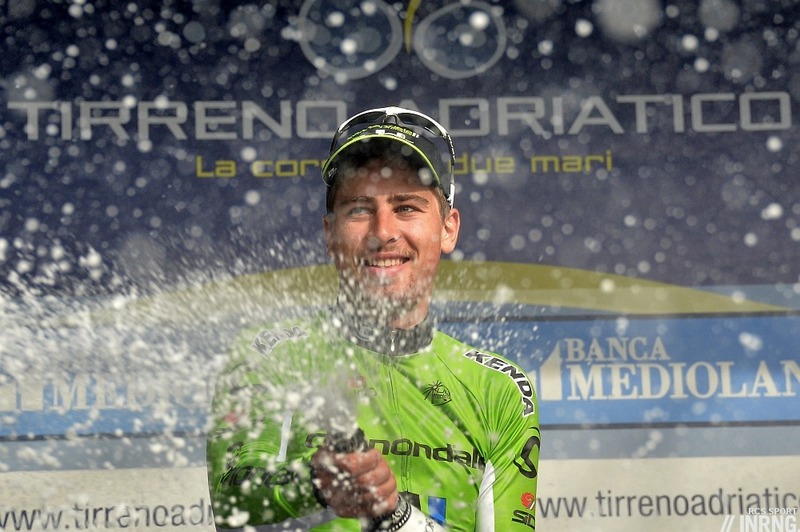 Sacha Modolo first made a name for himself in this race with fourth place in 2010 and is having a great early season. Other fastmen include 2013 winner Gerald Ciolek, Michael Matthews had a solid Paris-Nice but Movistar’s J-J Rojas was better in France. Katusha’s Alexander Kristoff lurks but he’s at his best when it’s wet and long distance, think the 2012 Olympic road race. What if it’s not a bunch sprint? If you believe in nominal determinism then Sanremo is known as la Cittá dei Fiori, the city of flowers and that the Kwiat- in Michal Kwiatkowski means flower in Polish. If such superstition isn’t for you and rational argument is more comforting then the Pole is in top form having won the arduous Strade Bianche. He could do well in this race but can he sprint for the win or will Sagan get the better of him? Kwiatkowski was second to Sagan in Arezzo the other day meaning he’s fast in the sprint too. 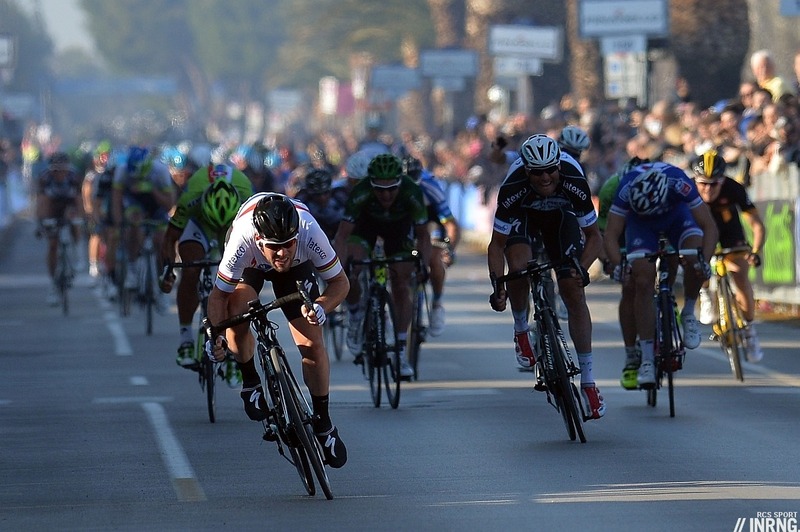 OPQS come with Štybar who is in excellent form after Paris-Nice, will they fire riders up the road or play the Cav card? If there’s a rider capable of out-riding the sprint trains it’s Fabian Cancellara. At first his spring prep seemed slow but he was second in the Tirreno-Adriatico TT and comes packed with experience. Philippe Gilbert seems made for this race, capable of searing attacks and packing a fast sprint but he’s yet to impress this year; instead BMC have strength numbers via Greg Van Avermaet for the podium assuming he’s found a spare glove, plus Taylor Phinney and Thor Hushovd and both live up the coast. Talking of homes, domestic Italian hopes rest with Modolo but Katusha’s Luca Paolini and Lampre-Merida pair Diego Ulissi and Pippo Pozzato are three riders who spent winter training for Pompeiana only to see their hopes crumble like the hillside soil, of the three Paolini is the best bet and has been in the top-10 several times. 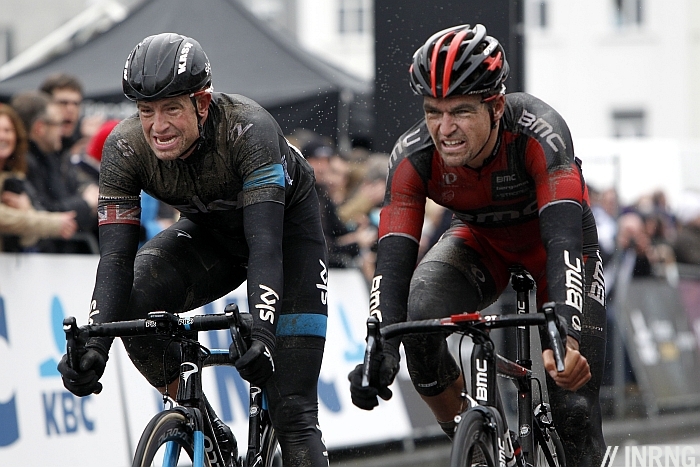 Sky can play the 1-2 with in-form Geraint Thomas and Edvald Boasson Hagen. Thomas has recovered and Boasson Hagen, well he’s often tipped but rarely wins yet was in thick of the action in Het Nieuwsblad. Orica-Greenedge have left past winner Matthew Goss to watch the race on TV but aren’t lacking firepower. Matthews is already tipped above but Simon Gerrans is out will illness so is the leader although he wasn’t convincing in Paris-Nice but that’s his style, he targets particular events although senza Pompeiana I’d mark Simon Clarke who had a good Tirreno-Adriatico, a fast finisher who climbs well; Darryl Impey is punch and sprints fast. Sylvain Chavanel was visible in Paris-Nice but often too visible, charging up the road too soon and he’ll need to play it stealthy; FDJ’s Arthur Vichot might be a safer pick. Tinkoff-Saxo have a strong team but riders like Kreuziger and Roche seem unsuited to the course, instead Daniele Bennati seems the best bet, once a sprinter and now a more versatile rider and in form right now. Normally this race is so selective that only the biggest names win although in Matthew Goss, Simon Gerrans and Gerald Ciolek it’s safe to say none are superstars so a final mention of the subdwarfs. Bardiani-CSF’s Sonny Colbrelli is having a good start to the year, Bryan Coquard is so fast but this comes from short-distance track racing. Ag2r’s Davide Appollonio can surf the wheels all day and pop up in the sprint, the same for Astana’s Andrea Guardini. A sprint finish is likely but not certain. 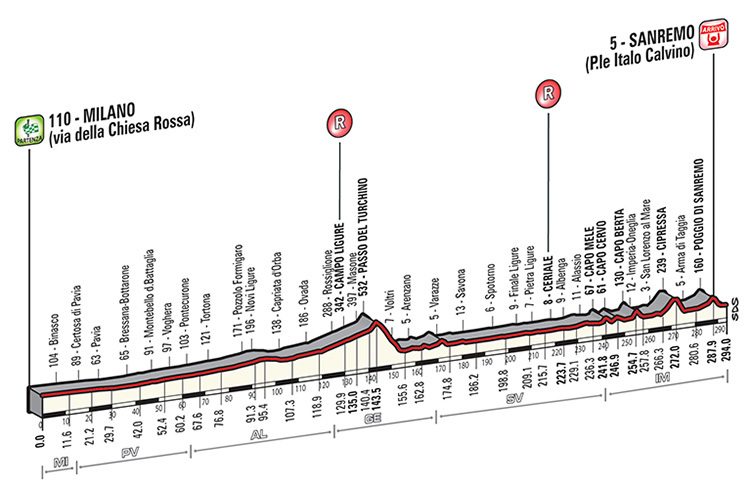 Don’t think of it as the final 200 metres: it’s a sprint to get into position for the Cipressa, a sprint out of every bend going up and then down then repeated on the Poggio, the suspense should last until the line. Sagan lead thanks to his all round ability but this is a race where mistakes along the course are like compound interest and add up with every passing kilometre. Weather: given last year’s race was so cold that even the chainring teeth were chattering the good news is that it won’t snow. The bad news is that it will be raining with the outside chance of a thunderstorm, heavy showers are forecast. The wind will turn, a light 10km/h headwind as they head along the coast then a northerly breeze meaning a slight headwind in aggregate up the Poggio and a tailwind off it. It’s weak but every detail helps. The rain is the most significant factor. The descents get even harder. It also means riders get colder faster in a race where calorie consumption is one of the keys to being in the front group. “Eat, drink, eat” goes the team briefing but easier said than done in a race that requires a finger on the brakes for the last three hours but ignore it and after 275km the lights go out. TV: Italian TV starts coverage at 1.40pm Euro time with live coverage starting from 2.00pm onwards, just about time to catch the race as it reaches the Med. Most international coverage picks up at 2.30pm CET. For many English-speaking readers, US viewers have BeIn Sport, UK is Eurosport and SBS in Australia. The finish is expected for 5.10pm Euro time but with a large margin given the distance involved. Part of the experience is watching the race build so tune in early if you can. Note the final hour is crucial with the capes and the hills. As ever steephill.tv and cyclingfans.com are the go-to sites for TV schedules and feeds. Fact: this is the longest race of the year, so long that it gets special dispensation from the UCI to exceed the normal cap of 250km. These are from recon rides, so the roads are open to traffic and this has a big effect on speed. They still give a good impression of the overall technicality of the descents, though. Also of note from the videos is how slick-looking the road surface is (although they were filmed in 2012). That kind of super-smooth surface is great in the dry, but can be unpredictable in the wet, and it looks like rain is in the forecast for Sunday. Degenkolb is my pick – he was impressive on the climb of Mont Brouilly in P-N, and has the adaptability to suit a race like M-Sr. I think you have a different Calendar to me inrng, by my reckoning the clocks don’t change until the 30th March. You’re quite right, the US has moved already, it’s the end of the month for Europe and Aussies change in April. Inevitable that “the next big thing” sees his trajectory level off. But he seems to be in good form and should find the course perfect. A late blow is Moreno Moser is out with a knee injury, weakening the team more. Nice preview, grazie. There’s also a bust of the first Campionissimo atop the Turchino. Sadly it doesn’t get much TV coverage these days, but I can tell you every time I’m up there the hairs stand up on the back of my neck while thinking of racing up this thing back-in-the-day before it was paved. Too bad spring will not be much in evidence based on the weather forecasts, La Primavera needs that sunshine on the Ligurian coast. I struggle with time zones. What is the expected finish-time if watching in the UK? I don’t really understand why so many people thinks Mark Cavendish is a favourite. It would be a big suprise for me if he could be up there in the end. He showed almost nothing this year (except one good finish to an incredible lead-out of his team). “One good finish to an incredible lead-out of his team” is all he needs. He has been doing some specific training for this, too late maybe but he’s motivated by the big races. Because you’d be a fool to discount him when there is a chance of a sprint finish. Showing nothing early season is about usual for him, always a slow starter. But after the OPQS train showing now they can get it right like HTC had in Stage 6 of TA (Thats holding it together, and taking advantage of what happens in the race) I think you’d be silly to discount him. The Olympic Road Race was long but it wasn’t wet. I remember a lovely day spent on Box Hill. The women’s race was run in horrible conditions but not the men’s. Agreed, was more thinking of the hard days in De Panne when he’s won too. What about Moreno Hofland? He certainly was good in Paris Nice beating Degenkolb in the sprint. He’s young and not so experienced, but he can cope with the climbs I think. And many young riders have surprised so far this season. Easy – he’s not riding. Good pick, he’s strong in long distance races. But like Chavanel he often charges up the road with 40km to go and gets caught with 20km to go. Powerful but with few wins to his name and he could be on duty for Démare and Vichot. FYI Ciolek’s first name is Gerald, not Gerhard. Thanks – must be infectious. meaning “rule of the spear” from the prefix ger- (“spear”) and suffix -wald (“rule”). Is there a headwind or tailwind on the poggio and the descent? A 12-15km/h breeze from the west, on aggregate a headwind to the finish but as you can see in the map above the Poggio snakes up and down. Fantastic preview as usual, thanks inrng. One point that you may be able to clarify though. The majority of the route may have reverted to the pre2008 version but hasn’t the finish changed since? So that it’s now 1.5 km or so closer to the bottom of the poggio and hence more difficult for the sprinters to get back? Why no Ian Stannard this year? After a creditable sixth last year and winning the Omloop this year, I would have thought he’d feature. He didn’t start the final stage of Tirreno-Adriatico, so maybe he’s ill.
I’m not sure of Stannard’s chances since his sprint isn’t the best. He can stay up with a lead group, but a rider like him might have a hard time getting away for good in a race like MSR. In any case, he’s not on the start list. Yeah, sorry, I meant why is he not racing rather than why is he not mentioned as a potential winner. I was wondering about Offredo, get where your coming from about him sticking his nose into the wind abit to much, but seen him at a couple of French races and the London one on the telly and he seemed to have clicked when it comes going in the right break. I want a Celte to win, although i’d put a fiver on Fab! It’s not a big place, the finish is by the sea front and you can’t miss it. A very good rider but selective in his wins and arguably his win at the time made him a star, he wasn’t so well known before. Sadly for him and the race he’s out, allergies/illness. The target is still Liège-Bastogne-Liège and without Pompeiana this wouldn’t be a race for him. Second in his stellar year he’s not really followed up since. Success in recent years have has lean so to win here would be big. There was a good interview in Rouleur magazine that was very frank, none of the “I’d like to win X race” (wouldn’t we all) but it touched on alcoholism and other issues. Nice preview. I guess Van Avermaet deserves a win this big by now, if only beacause of how much he is being made fun of. “Sprinter Cell”. You sir / madam, are a genius. Love this race. I’ll be cheering for OPQS – Kwiatkowski more likely than Cav, methinks – but it would be good I think if Sagan can bag a monument at last. Gotta love the spring! And what about Rojas Gil? 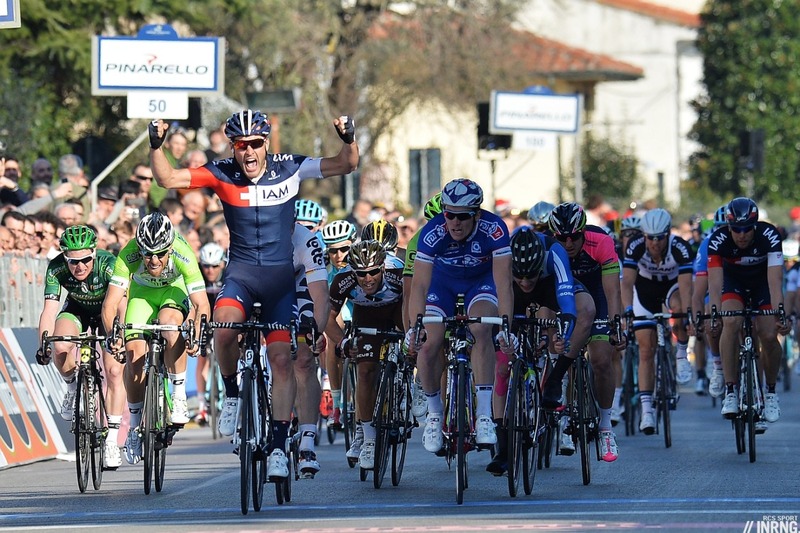 After a perfect Paris – Nice it could be a great Sanremo. He’s listed above and is a good pick because he’s consistent, fast and takes the short climbs in his stride. He has a good team in his service too. The only problem? He’s an expert in finishing fourth, he’s got more chocolate medals than Nestlé. By a mere fluke I’ve managed to find myself in San Remo for the MSR. First time I’ve been here, does anyone have recommendations on where in San Remo to watch the race? Is it worth watching the climb of the Poggio, or better off staying in near the finish line? It’s a horrible evening in San Remo for what it counts! The Poggio is ok but crowded and there’s not much space to stand. 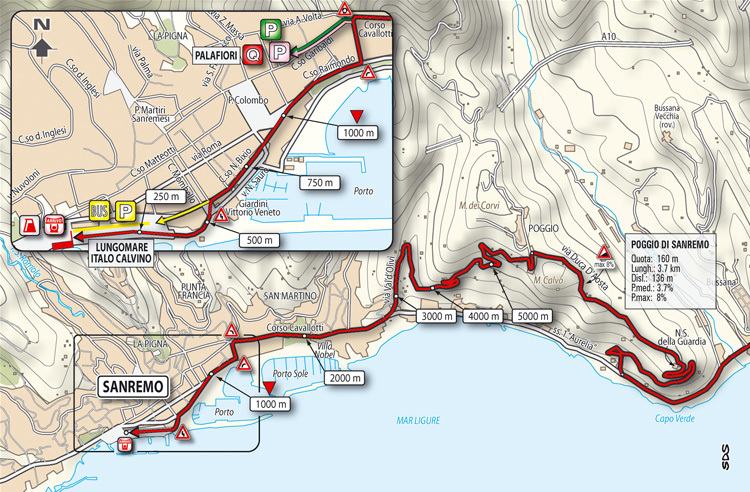 Given rain is forecast you might prefer Sanremo because of the large screen TV, the announcers on the finish line… and a cafe to seek refuge in. If the weather’s not bad, do what we did in 2010 (more details here http://cycleitalia.blogspot.com/2010/03/la-classicissima-milano-san-remo-part-1.html) ride your bike down the coast, then turn up the Poggio climb. Get up there by lunch time and find Il Rustichello. Order the full meal, antipasto to dolci and watch the race unfold on their TV. When the race gets near the top of the Poggio race out to see them go by, then run back into the osteria to see the finale on TV. Then ride back to Sanremo. Bad weather? Mr. Innrg’s advice is the way to go. I thought I changed it after anonymous’s comments above but it didn’t go through… fixed now. Disappointing that Ian “OP KOP” Stannard is not riding this year, but on the positive side this could mean he is moving up in the pecking order for the cobbled classics, to protected rider? I’m going all out cross with Zdeněk – he’s finding form and just needs the opportunity. Some pretty handy money for Kwiatowski…$51 in Australian terms. It’s anyone’s race though! I really like the look of my 80/1 on Kristoff taken at the end of February when the route changed back again to a sprinters race. That, and my Greipel at 14/1.. I have also backed Degenkolb as right now I think he has a better chance than Sagan and Cavendish who are shorter in price to him. I also like my 200/1 on Kreuziger – I see you think he’s not suited to the course, but he’s in great form after Tirreno and could well get involved up the Poggio..
I’ve been thinking about Kreuziger, he’s in very good form… but surely nobody will let him go solo like in the Amstel again? He’s not a fast finisher either. The Ardennes suit him so much more. Good call on Alexander Kristoff. Cold and wet and a long race.